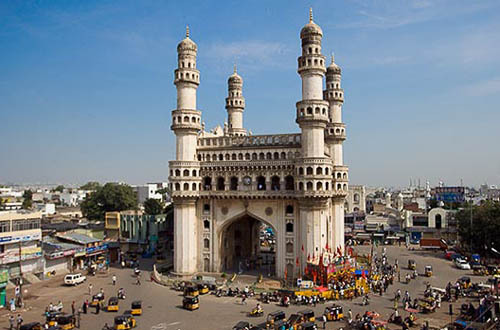 The elections for Hyderabad Mayor and Deputy Mayor have just completed. 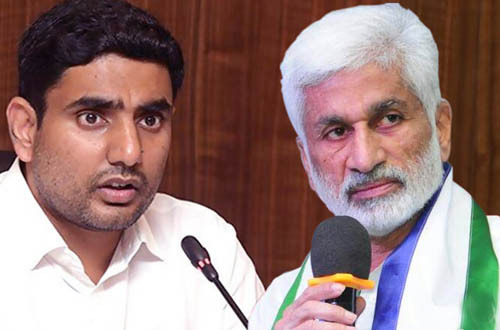 MIM Party's Ahmed Nagar Corporator Mohammed Majid Hussain and Congress Party's Kavadiguda congress Corporator G. Raj kumar have been unanimously elected as the new Mayor and Deputy Mayor of Greater Hyderabad Municipal Corporation. Though MIM has nominated its Mayoral candidate a couple of days ago, but declared only a few hours before the elections. There has been a lot of speculation regarding Congress candidate for the Dy Mayor post. 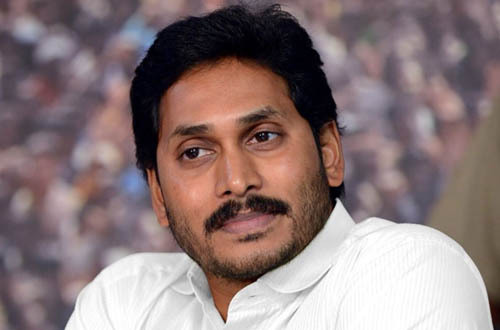 Congress leadership had just hinted at nominating someone from BCs, but who is going to get the chance was difficult to guess as there were several BC contenders trying their best. Finally, ministers Geetha Reddy, Danam Nagender and PCC chief Botsa Satyanarayana held meeting of Congress corporators at Gandhi Bhavan and decided to nominate Kavadiguda Corporator G Raj Kumar. Head over to ubislate.com, rightaway. If you're among those who're waiting to lay their hands on the upgraded version of the UbiSlate 7 tablet, which is the commercial version of the Aakash tablet, i.e. UbiSlate 7+ can now do so, since the tablet has gone up for pre-order on the official site. However, those preordering UbiSlate 7+ will be able to avail it only in March, since units scheduled to reach users by January and February have already been sold out. The UbiSlate 7+ will run on Android 2.3. The UbiSlate 7+ is being offered for Rs.2,999, which is slightly higher than UbiSlate 7 (Rs.2,499). But, the upgraded version is definitely worth a consideration, since for just a few hundreds more, users are being offered a good deal. 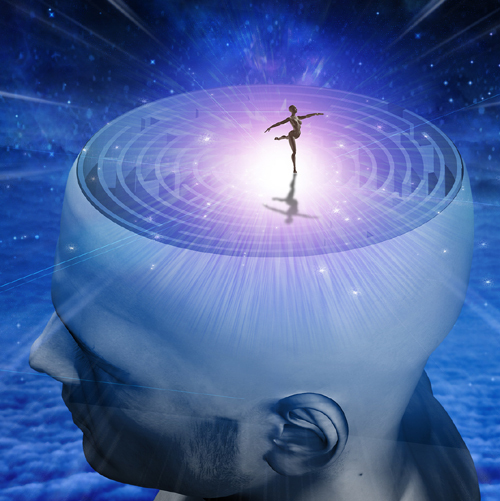 Check out its features, in detail here. The UbiSlate 7 came with an ARM11 – 366MHz processor, while the UbiSlate 7+ packs in a Cortex A8 – 700 MHz processor, which means you get a faster running device for a slight hike in the price. In addition to Wi-Fi connectivity, which the UbiSlate 7 offered, too, the UbiSlate 7+ comes with added GPRS functionality. The new tablet will also come with DataWind's patented UbiSurfer browser, which according to its manufacturer, DataWind offers "accelerates web pages by factors of 10x to 30x, allowing for a web experience who’s speed is unrivalled." Come 3 January (Tommorrow) and it would be complete one year since Rayalaseema faction leader Maddelacheruvu Suryanarayana Reddy alias Suri was murdered in broad daylight at Hyderabad. Yet, there is no trace of Bhanu Kiran, the main accused of Suri's murder. Bhanu Kiran was a close friend of Suri and this friendship made Bhanu a close aide of Suri. 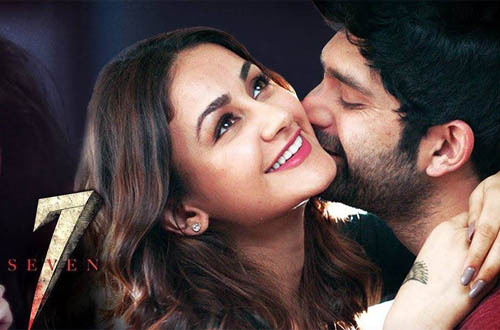 When Suri was arrested in the car bomb case, Bhanu used to meet him regularly and these meetings bonded their friendship even more and turned Bhanu as a loyalist of Suri. When, suri was in jail, Bhanu managed all the activities of Suri including finance and also did settlements in the name of Suri. For almost 10 years, Bhanu was running all the activities and all the property, money of Suri was under Bhanu’s benami name. It is also heard that Bhanu saved all the money with friends and relatives abroad and in return he was earning 50-70 lakhs a month. 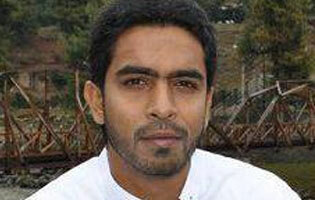 Police says that the whereabouts of Bhanu are still not known, though many rumours have been doing rounds about him. Police could so far gather information that after the murder, Bhanu travelled to Sholapur along with Gunman Manmohan Singh. 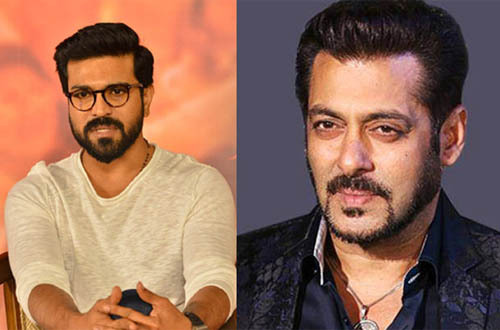 From there, the duo went to Indore and from there to Delhi and Gurgaon. In Gurgaon Bhanu stayed for 13 days in a guest house. This information was given by gunman Manmohan Singh, who was later arrested by the police. The state CID, which has taken up the investigation lately, says that it has the information of Bhanu moving in different disguises in West Godawari district and they are trying to nab him. 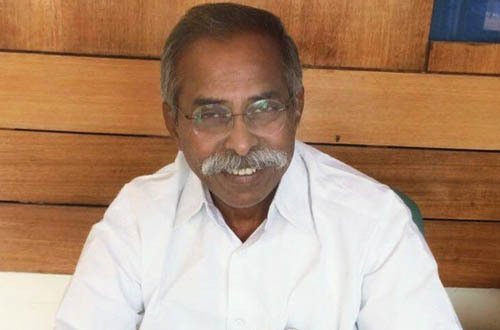 Not to be left behind, state Textiles Minister P Shankar Rao recently made a sensational statement that according to his reliable sources, Bhanu has also been killed. The death toll in severe cyclonic storm 'Thane' reached to 35 so far. Cyclone Thane, that crossed the coast between Cuddalore in Tamilnadu and Union Territory Puducherry early on Friday morning, weakened by Saturday morning leaving in its wake a trail of devastation. Cuddalore district collector V Amuthavalli said that more than 5,000 houses of fishermen were damaged in the cyclone. An exact figure of casualties was not available yet, she said. Local reports said that most of the deaths were due to wall collapses, electrocution, drowning and severe cold. While Chennai escaped the much of the fury of the cyclone, a woman was killed in a building collapse and a man was electrocuted. 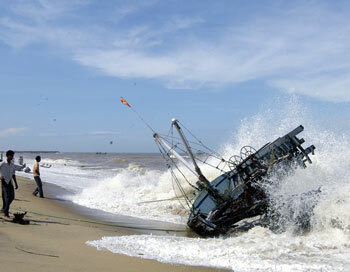 In Andhra Pradesh, no casualities barring a couple of missing fishermen have been reported so far. However, huge damage to houses and plantations like coconut and casuarina on the coast has been reported. Officials from revenue and fisheries departments formed into teams and are visiting the affected villages to enumerate the loss and damage. A final report is expected in a day or two. Cyclone Thane crossed the coast between Cuddalore in Tamil Nadu state and the territory of Puducherry early on Friday sending severe cyclone packing winds of up to 140 kilometres (85 miles) an hour that tore into India's southeastern coast. The storm has resulted in the death of 19 people so far. Reportedly 12 people have been dead in Cuddalore and seven dead in Puducherry. The landfall happened very close to Cuddalore, southeast of Puducherry. The system is likely to move westwards and cross north Tamil Nadu coast, close to south of Puducherry, within a few hours and weaken gradually. As a result very heavy rainfall will continue over Northern Tamil Nadu, Puducherry and Rayalseema. The damage and loss of life in these two places was mainly caused by strong winds, heavy rainfall and storm surges that led to the collapse of old, rickety buildings. Indian meteorological officials predicted "heavy to very heavy" rainfall over places in Tamil Nadu, Puducherry, Kerala and Karnataka during the next 24 hours. Squally winds were likely to blow over north Tamil Nadu during the next three hours before decreasing in intensity gradually. Eight teams of the National Disaster Management Force (NDRF) have been sent to the coastal areas. Two of these teams will be in Andhra Pradesh, rest six in Tamil Nadu in view of the cyclone warning. Another 15,000 men of the NDRF are on alert. Chennai Corporation - 1913, 25619237; Kancheepuram district administration - 1077, Police control room - 9445465536, 27238001; Tiruvallur district administration - 27661200; Police control room - 27661010. Under the impact of intense cyclonic storm Thane, which hit the coast between Cuddalore in Tamil Nadu and Puducherry Friday morning, parts of Nellore, Prakasam, Guntur and Chittoor districts have been receiving heavy rain since this morning. 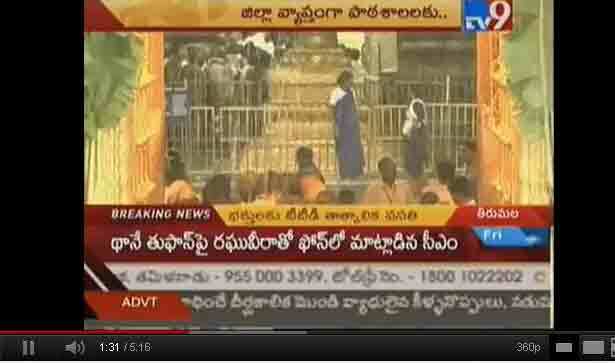 The Tirumala Tirupathi Devasthanams (TTD) has been put under high alert. Heavy rain accompanied by strong gale continue to lash south coastal Andhra and Chittoor district of Rayalaseema region. Two villages of Kandriga block in Chittoor district have been inundated. 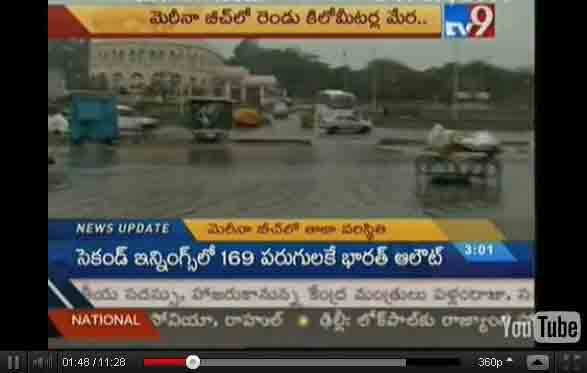 Chittoor, Tirupati and other towns in Chittoor district received heavy rain since early morning. Authorities have declared a holiday for all educational institutions. Since two days only left for the New Year, heavy rush of pilgrims is expected on Tirumala Hills for Lord's darshan. In view of the inclement weather caused by severe cyclonic storm 'Thane', TTD even released an appeal to public to postpone their visit to the temple town on occasion of the New Year. However, the TTD authorities are making efforts to provide safe accommodation for the pilgrims. The India Meteorological Department (IMD) has forecast rain at most places in coastal Andhra and Rayalaseema over the next 24 hours. 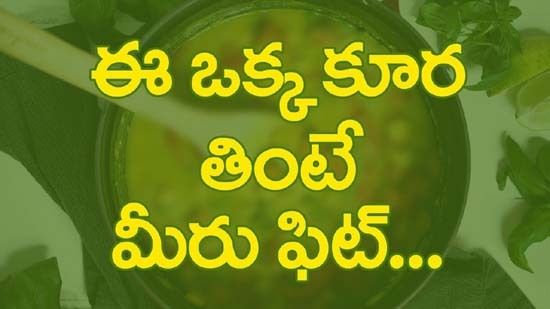 All nine coastal districts, particularly south coastal districts and Chittoor are on alert. Authorities have evacuated people from some coastal and low-lying villages. 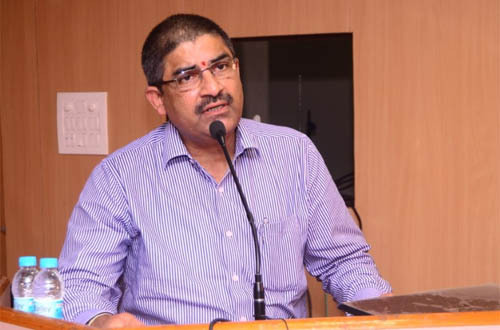 Four senior IAS officials were deputed to Nellore, Prakasam, Guntur and Chittoor districts to supervise rescue and relief operations. 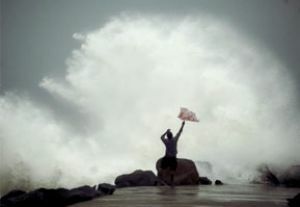 Cyclone Thane crossed the coast between the Union territory of Puducherry and neighbouring Cuddalore district in Tamil Nadu at about 9 am on Friday. 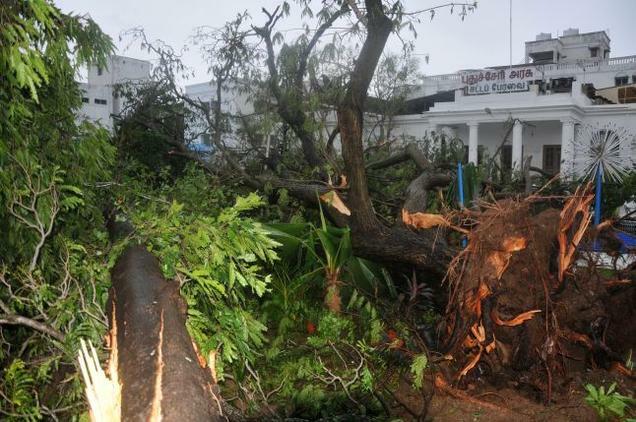 As it passed the coastal Puducherry and the sea-side Cuddalore town and villages, the cyclone vented its fury, uprooting trees and electric posts. Power supply had been cut 12 hours ahead of the expected cyclone landfall. Under the influence of the cyclone, isolated rain is predicted over north Tamil Nadu and Puducherry till Saturday afternoon. Heavy rainfall is also predicted over south coastal Andhra Pradesh and Rayalaseema. Fishermen along north Tamil Nadu, Puducherry & south Andhra Pradesh coasts are advised not to venture into sea during next 24 hrs. Cyclone Thane storm is getting more intensified as it is nearing the land. The storm is expected to cross the coastline near Chennai on Friday morning. The cyclone alarm No.3 Orange Signal has been hoisted along all the beaches from Visakhapatnam to Pondicherry. High tidal waves continue to lash the Marina Beach in Chennai and water has reached upto Vivekananda House. Almost all the sand dunes in Marina Beach are covered by the storm water and has reached the highway, which is nearly 2 kms. away from the original shore. 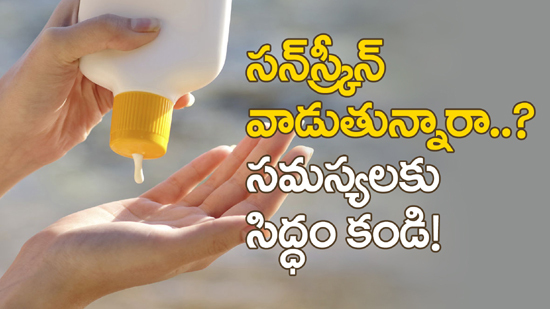 Similar situation is prevailing in southern Andhra Pradesh coastal towns like Uppada and Mypadu Beach near Nellore. 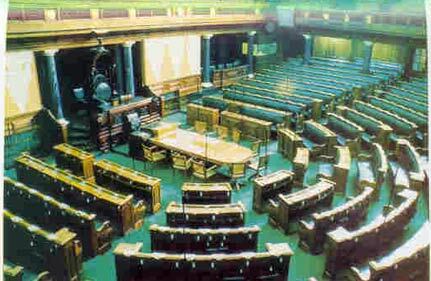 Lok Sabha winter session that started on 23 November, was adjourned sine die on Thursday. The month-long Winter Session of the Lok Sabha, which witnessed turmoil on several issues including FDI in retail, saw passage of several bills by the House, especially the Lokpal and Lokayukta Bill. It also witnessed the Government suffering embarrassment in the wake of the defeat of the Constitutional status for the anti-graft ombudsman. The session witnessed stalling of House for nearly two weeks over various issues including FDI in retail and the opposition demand for an adjournment motion on the issue of price rise which was later accepted on a mutually acceptable wording. 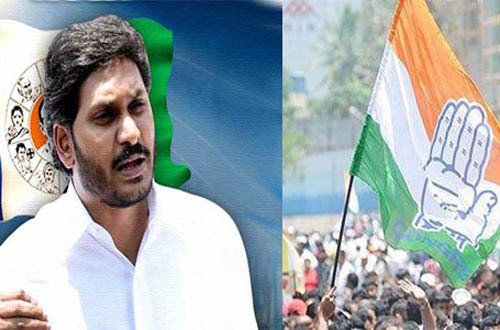 The NDA boycott of Home Minister P Chidambaram on the 2G issue, Mullaperiyar row and demand for separate Telangana led to tumultuous scenes during the session, which was extended by three days from December 27 to 29 to take up important bills, particularly the Lokpal Bill. No private member business could be taken up due to adjournments. Cyclone Thane storm is intensifying further and further as it is approaching the coast near Chennai. Tamilnadu and southern coastal districts in Andhra Pradesh are the most affected areas in this Thane cyclone storm. 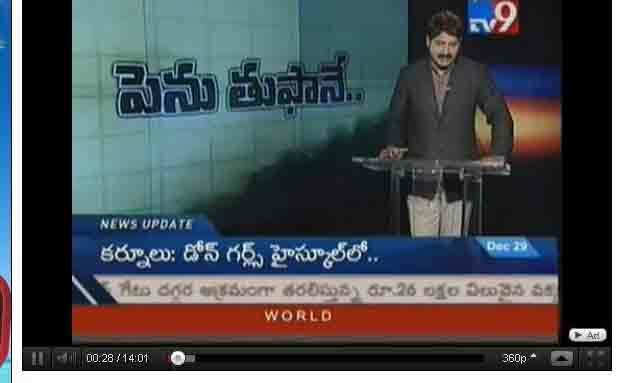 Here are the latest video updates from East and West Godawari and Nellore districts. 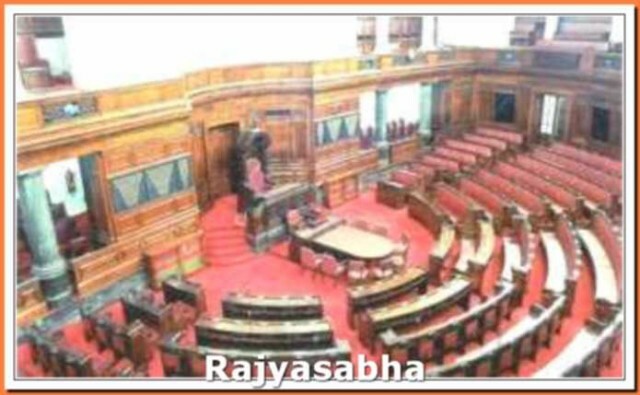 The Lokpal and Lokayuktas Bill, 2011, was moved for consideration and passage in Rajya Sabha on Thursday by Minister of State for Parliamentary Affairs V Narayanasamy. The bill has already been passed by Lok Sabha late in the evening on Tuesday. The UPA does not enjoy a majority in the Rajya Sabha. Several political parties, including certain UPA allies, are opposed to some provisions of the bill. “I hope that everyone will come around. We will have to carry everybody and pass the bill,” Union Minister Minister V Narayanasamy said. Starting a discussion in the House explaining the features of the bill, the minister said "I hope that everyone will come around. We will have to carry everybody and pass the bill." However, the Trinamool Congress was firm in its demand for deletion of Lokayukta provision from Lokpal Bill. It is likely to press for amendment in Rajya Sabha. Trinamul, which has 6 members in the 243-member Upper House where the Congress and its allies do not have majority, wants removal of the provisions relating to the setting up of Lokayuktas in the state which is contained in the Bill passed by Lok Sabha. Mr. Narayanasamy said it has been made clear that the Lokayukta aspect will not come into force without consent of the state. 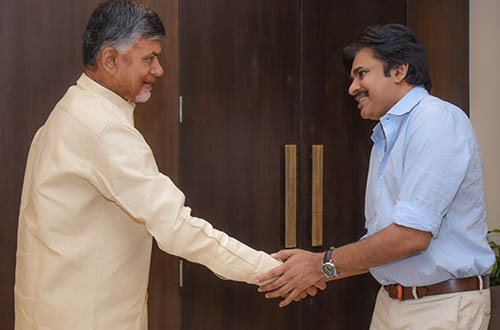 Asked if the need for a Joint Session of Parliament for passage of Lokpal Bill would arise if it failed in Rajya Sabha, he said, "I don't visualise that situation." The debate on the bill is going on and it can not be confirmed at this stage whether it would get a clear passage or a joint session of both the Houses is required. Crusader against corruption Anna Hazare, who has been fasting for the past two days protesting over a government introduced 'weal' lokpal bill, has ended the fast a day before this evening. Poor crowds and failing health forced him to end his three-day fast ahead of schedule and he also called off all other agitation plans, including a jail bharo protest and gherao of MP homes. Anna had earlier announced he would come to Delhi on December 30 and sit on a dharna outside Sonia and Rahul Gandhi's homes to protest the "weak" Lokpal followed by jail bharo agitation across the country. However, Team Anna member Arvind Kejriwal announced, "everything (all agitations) has been called off". 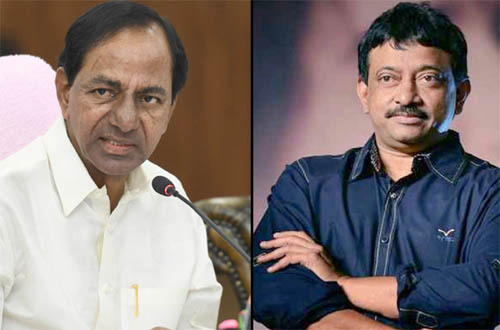 "'Lokpal Bill' reached Hyderabad" - The news might be a bit confusing, but it is true, right now the 'Lokpal Bill' which is to be presented in the Rajya Sabha, is in Hyderabad. The reason for Lokpal Bill to come to Hyderabad is the President of India Smt. Pratibha Devi Singh, who is on her winter sojourn of southern states and is currently camping in Hyderabad. The bill needs Presidential approval for the ten amendments that have taken place in the bill yesterday while it was passed by the Lok Sabha. The President has to approve the amendments today, so that the bill can be tabled in Rajya Sabha tomorrow. 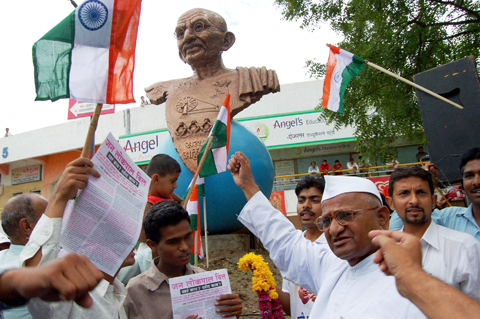 Fasting social activist Anna Hazare, whose health condition has been a major concern for his team as well as the government, is showing improvement. 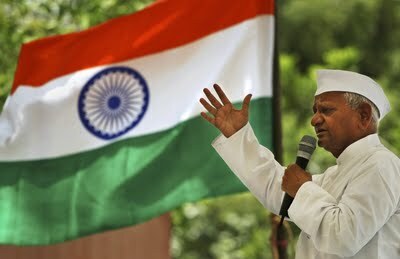 Anna's fever subsided on Wednesday morning, the second day of his three-day fast against a weak Lokpal Bill. Doctors and members of Team Anna made a fresh appeal to him, urging him to end the fast. The 74-old Anna has, however, shown no signs yet that he is willing to consider this request. At the end of his first day of fast (Tuesday), Anna's fever had climbed to 102 degrees and his blood pressure was 170/104. However, his temperature has now come down to 100 degrees. Team Anna member Manish Sisodia said that it was imperative that Anna started eating so that he could take medicines. "We are trying that he ends his fast," he said. A doctor who examined him said that he had been advised rest but added that Anna was expected to be present on the stage nevertheless. Doctors are monitoring his health and are likely take a decision on whether Anna should be moved to a hospital. Anna's family physician Dr Anirudh Dharmadhikari wants him to end the fast. "He is stubborn and is sticking to his fast. In this state, it is wrong of him to fast. We might need to hospitalise him because he is coughing, has fever," he said on Tuesday night. Doctors from Mumbai's JJ Hospital are stationed now at his camp at MMRDA Grounds and an ambulance is on stand-by. The Congress Party has decided to table the Lokpal Bill in Rajya Sabha on Wednesday. The bill is expected to be presented in RS post lunch today itself. 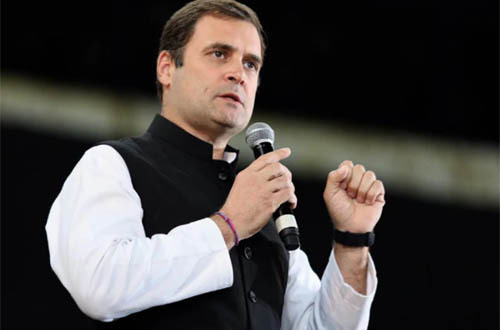 Though the Congress originally wanted to table it on Thursday, but in view of the opposition's plan to protest against delay in tabling the bill has forced the government to alter its decision. Rashtrapati Bhawan is still awaiting request from the government for tabling of Lokpal and Lokayukta Bill in Rajya Sabha. 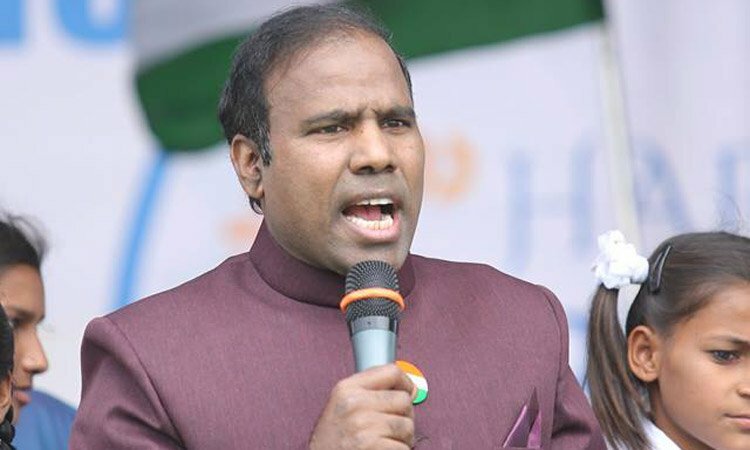 Union Minister V Narayanasamy had said the Lokpal Bill will have to get presidential assent in the wake of amendments made to it in the Lok Sabha on Tuesday and it can be tabled in the Rajya Sabha after that. It is expected that the Presidential nod will be obtained by today afternoon for tabling of the bill in Rajya Sabha. However, in the 245-member Rajya Sabha, the Congress and its allies account for only 92 and fall short of a simple majority. New Lokpal Bill: What is Bothering the Leaders? Irrespective of Parties, two things are bothering the political leaders in the government introduced new Lokpal Bill. One is the provision for constituting Lokayuktas in states and the other one is the section 24 of the new Lokpal Bill. The section 24 gives the power to presiding officers to act against ministers and MPs on the basis of the Lokpal indicting them for graft. 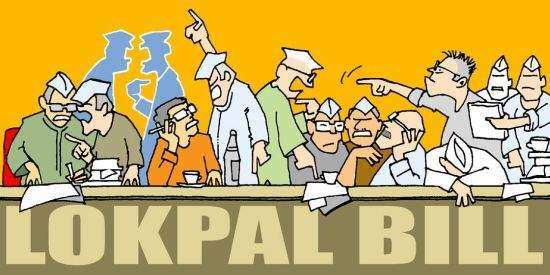 The bill allows presiding officers to act on the basis of a Lokpal report even before a trial is completed. 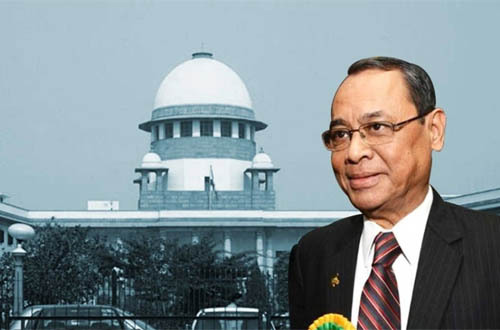 The Lok Sabha speaker or chairman of Rajya Sabha is required to table the Lokpal report and inform the Lokpal about the action being taken — or not taken — against the members concerned. The procedure has been prescribed in cases where at "the conclusion of investigation, the findings of the Lokpal disclose the commission of an offence under the Prevention of Corruption Act, 1988, by a public servant... (The) Lokpal may file a case in the Special Court and shall send a copy of the report", says section 24 of the Lokpal Bill. With the bill stating that presiding officers will tell the Lokpal about "action taken or proposed to be taken on the basis of the report", the political class finds itself under increased threat. This provision is sure to attract several amendments with MPs pointing out that the bill does not even state the need for the trial process to be completed. The scheduled debate on Lokpal Bill in the Parliament on 27, 28 and 29 December are expected to hover around these two points, with the politicos trying to do away or minimize these two provisions. Social activist Anna Hazare's health becomes a concern to his team ahead of his three-day fast scheduled from 27 December at MMRDA Grounds in Mumbai. Anna has been unwell for the past three days but Team Anna is confident that it won't stand in the way of the scheduled protests. Anna's doctor said that he is fit to go ahead with the fast. 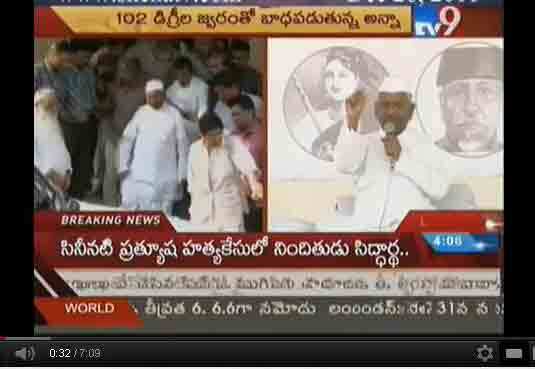 "Anna is having cough, cold and bad throat for last three days with weakness and little bit loss of appetite. He is taking rest for last two days. 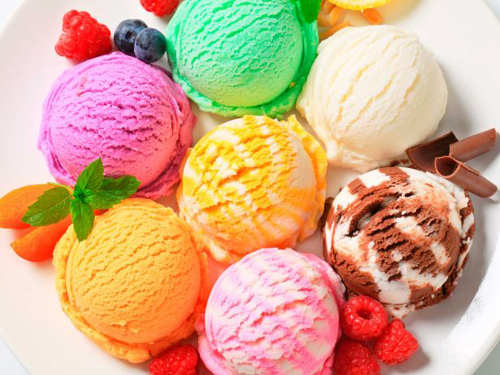 These are signs of viral fever," said the doctor. "He will be ok and he can go on a fast. I have prescribed him soft antibiotics," he added. Anna is expected to reach Mumbai on Monday. While Team Anna is making preparations for the three day fast at MMRDA Grounds in Mumbai to protest against the 'weak' Lokpal Bill, the government on the other hand says it would deal the issue with an iron hand. Speaking to the media, union minister of state in the PMO V Narayanasamy said the lokpal bill cannot be passed by "someone on the streets or in maidans" and it would deal with the issue with "an iron hand". "A team of five members cannot pressurise the government on passing a bill. A bill can be passed only in Parliament after voting. 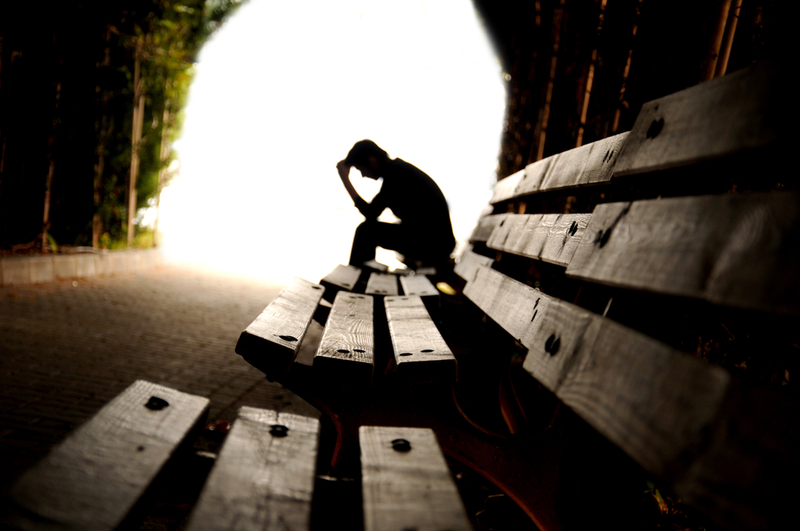 Parliament alone can pass the bill, and not by someone on the streets or maidans. They cannot decide for Parliament. We will handle this with an iron hand," he said. 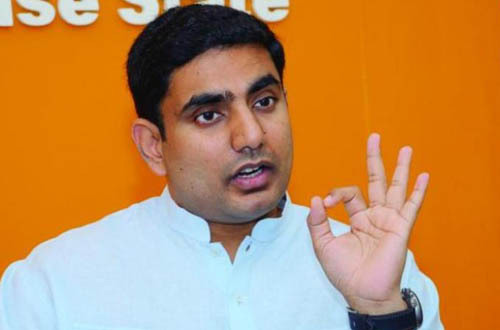 His comments came as the Team Anna locked horns with the government rejecting the lokpal bill tabled in Parliament as 'weak'. Anna Hazare, spearheading the movement for a strong Lokpal, is set to undertake a three-day fast in Mumbai from December 27 to pressurise the government to accept their demands including bringing CBI under the ambit of the anti-corruption ombudsman. The bill, slated to be debated and passed in the extended winter session of Parliament from Tuesday, has also come under scathing attack from the opposition parties, including BJP which is up in arms on the minorities reservation clause. Speaking at the conference 'Electoral Reforms in India - The Role of Intellectuals' on Friday, Union Minister for Law Salman Khurshid said all demands of Anna Hazare on Lokpal Bill "cannot be accepted" and the activist has to decide the "limits" of his exercise. "We have included all good points (suggested by Team Anna) in the Lokpal Bill. But not everything they say we are in a position to accommodate because a lot of other people think differently," said the minister. 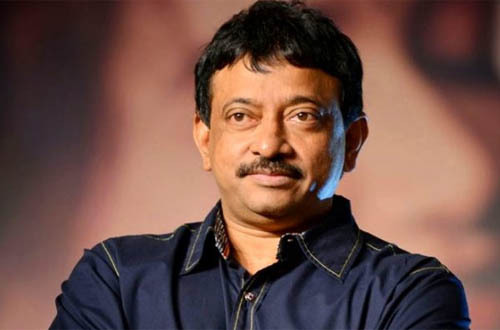 Asked whether he would appeal to Hazare to not go on fast from December 27, he replied that personally he would not do so, but would if the government takes a collective decision on the matter. "But (for now), there is no such decision taken by the government," he said. "Anna Hazare has a role to perform and it is a legitimate exercise, but he has to decide what the limits of exercise are," Khurshid said, adding that the government would not advise him on that front.